Beetiful designed the book cover for Good Girl by Brill Harper. He’s got a record; she’s never been so much as grounded. His old man is a convict; her dad is the police sergeant. He’s seen too much darkness; she can barely see out of the stained-glass curtain the world wants her to hide behind. She’s willing to fight her parents, the town, and the whole world if she has to, but first she has to get past the wall Joe Franklin has built around his heart. He thinks she’s too good, too sweet, too pure for a man like him. She thinks being good is overrated. Author Confession: It’s the classic opposites attract, good girl/bad boy, other side of the tracks, her first time tropey goodness you need in your life. Watch him grow into an alphamallow right before your eyes. And when the slow burn romance ignites, it will scorch your eReader. 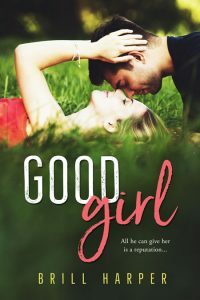 Get Good Girl by Brill Harper today!